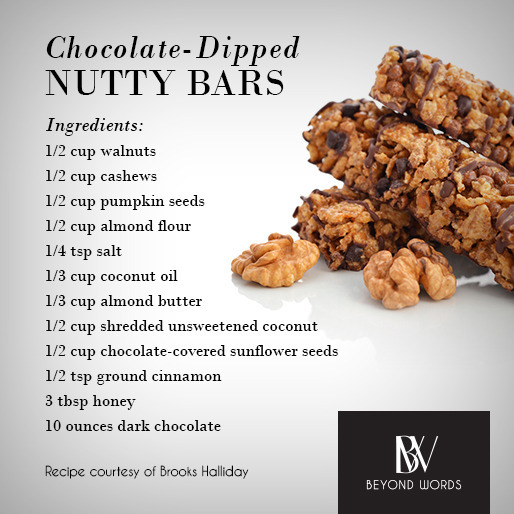 If you think vegan cuisine is just for rabbits, try some of these decadent holiday recipes, sure to please even the most carnivorous of appetites. Instructions: Preheat the oven to 350 F. Line a baking sheet with parchment paper. 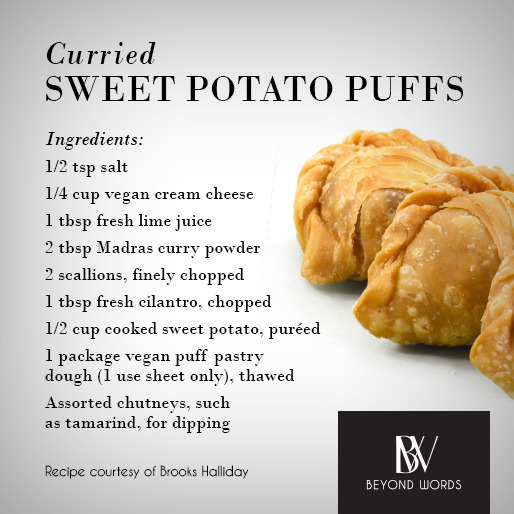 In a medium bowl, combine sweet potatoes, cream cheese, lime juice, curry powder, scallions, cilantro and salt. Take one sheet of puff pastry and cut it into 4 equal rectangles. Cut each rectangle in half, then cut each half into 2 triangles. Place a teaspoon of sweet potato filling on one half of each triangle, leaving a small border at the edge. Keep dough covered in plastic when not working with it. Fold triangles in half and seal the edges firmly (dampen edges of dough lightly with water if too dry to seal). Transfer filled triangles to prepared baking sheet and bake until golden, about 10 minutes. Serve warm with assorted chutneys on the side. Instructions: Preheat oven to 350 degrees F.
Using a slightly damp paper towel, gently scrub mushrooms and remove stems. Brush both sides of each mushroom with olive oil and sprinkle with salt and pepper. In a medium skillet over medium-high heat, add remaining oil. Sauté leek and garlic until soft and fragrant, about 5 minutes. Using a clean kitchen towel, wring out as much water from the spinach as possible. Add to the pan and cook for 2 minutes. Add nutmeg and coconut milk. Cook until just heated through. Fill each mushroom with spinach filling and top with a sprinkling of nutritional yeast. Transfer to a baking sheet and bake until golden brown, about 20 minutes. Serve warm. Instructions: In a large pot, completely cover edamame with salted water. Simmer until tender, about 5 minutes. Drain. In the bowl of a food processor, combine edamame and remaining ingredients. Puree until completely smooth. Transfer to a serving bowl and garnish with cilantro leaves and smoked salt. Preheat the oven to 325 degrees F. Line two baking sheets with parchment paper. Combine flour, salt and rosemary in a food processor until well blended. In the bowl of a stand mixer, combine butter and powdered sugar. Beat until light and fluffy. Add vanilla and flour mixture and mix until dough just starts to come together. Do not over-mix. Turn dough onto a floured surface and bring together with hands. Sandwich dough between two sheets of plastic wrap. With a rolling pin, roll dough to approximately 1/4-inch thick. Refrigerate until firm, at least 30 minutes. Using a cutter, cut out cookies and place them on the prepared baking sheets. Return to the refrigerator for an additional 20 minutes. Transfer pan immediately to oven and bake until the edges are golden brown, 18 to 20 minutes. Transfer to a cooling rack and cool completely before serving. Line a baking sheet with wax paper or parchment. In a food processor, combine almond butter, almond flour, honey, lemon juice, lemon extract, salt, 3/4 cup coconut and 1 teaspoon lemon zest until smooth and paste-like. In a shallow dish, combine the remaining coconut and teaspoon lemon zest, using fingers to thoroughly combine. Using damp fingers, take 1 teaspoon of the almond mixture and roll into a ball. Roll ball in coconut lemon zest mixture, pressing to ensure it’s completely coated. Transfer to prepared baking sheet. Refrigerate meltaways in an airtight container until completely firm, at least 1 hour and up to 2 days. Preheat oven to 325 degrees F. Line the bottom and sides of an 8×8 baking dish with parchment paper. In the bowl of a food processor, combine walnuts, cashews and pumpkin seeds. Pulse until crumbly and thoroughly combined. Stir in sunflower seeds. Transfer mixture to a large bowl and stir in almond meal, coconut, cinnamon and salt. In a small heavy-duty pot, warm coconut oil and almond butter over medium heat. Whisk together until mixture is thoroughly combined, melted and smooth. Remove from heat and stir in honey. Pour coconut oil mixture over nut mixture in the large bowl, using a spatula to thoroughly combine. Transfer mixture into the prepared baking dish. Using wet hands, press down evenly on mixture, ensuring it sticks together solidly. Transfer to oven and bake for 30 minutes. Using several layers of parchment paper, press down on the mixture again firmly. Allow to cool. Wrap bars tightly in plastic wrap and transfer to the freezer for two hours. Once bars are cold and completely solid, cut into squares. Line a baking sheet with wax paper. Chop chocolate into fine pieces and melt in the microwave at 50% power for 1 minute. Stir and microwave again until chocolate is melted. Dip each bar halfway into the chocolate (I like to dip at a diagonal, so the chocolate half is shaped like a triangle). Cool completely, allowing chocolate to harden, before serving.